The Les Paul gets the Royale Treatment!The new Epiphone Ltd. Ed. 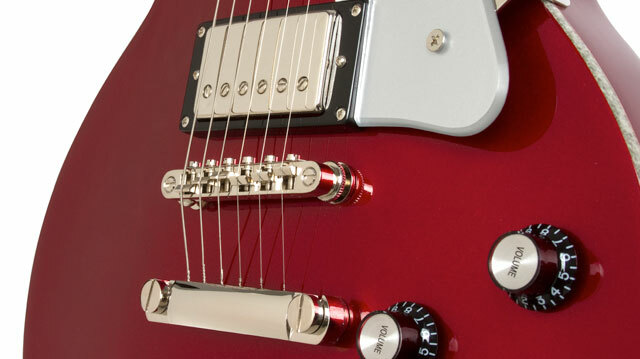 2014 Red Royale Collection features three of Epiphone's most popular classics in a beautiful Red Pearl color finish. The striking Red Pearl finish is reminiscent of the first wave of custom colors made by Epiphone in the 1960s and has a warm, deep, scarlet tone that’s set off by Epiphone’s distinctive Royale Collection Silver Sparkle binding. Each Red Royale Collection instrument features all of the modern, top-shelf pickups and hardware you’ve come to expect from Epiphone, and of course, a lifetime guarantee. In other words, the Royale Treatment! And no Royale guitar collection would be complete without the king of electric guitars, the Les Paul Standard! Epiphone's long friendship with legendary guitarist and innovator Les Paul dates back to the early 1940's when Les, working late at night at the Epiphone factory on 14th Street in New York City, created one of the world's first solid-body electric guitars, which he nicknamed "The Log." Today, the original “Log” sits in the Country Music Hall of Fame. But the guitar that came out of those experiments became the Les Paul, the most sought after electric guitar in the world. For the rest of his life, Les continued to work closely with Epiphone luthiers reviewing new product ideas and offering suggestions in his quest to make a guitar that could “sustain for days” and give guitarists any sound they could imagine. “Epiphone always made a good guitar,” Les often said. Today, over 50 years after it was first introduced, the Les Paul Standard is still the king of electric guitars. Now, Epiphone’s Ltd. Ed. 2014 Les Paul Standard Red Royale brings you all of the “LP Standard” rock and roll mojo in a Ltd. 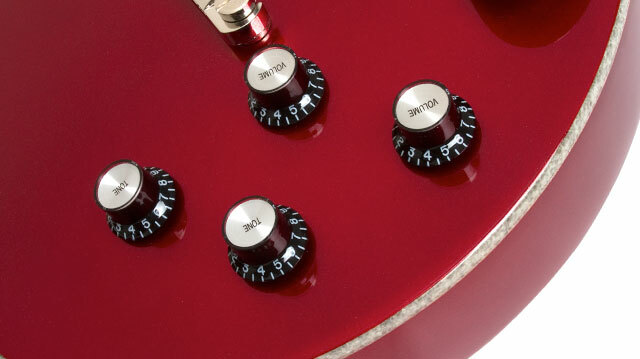 Ed.--and one of a kind--Red Pearl finish. Like all Epiphones, the Ltd. Ed. 2014 Les Paul Standard Red Royale features a Limited Lifetime Warranty backed by world famous 24/7/365 Gibson Customer Service. Les Paul Standard fans include the best of the best in every genre including Slash, Zakk Wylde, Joe Bonamassa, Tommy Thayer of KISS, Mark Knopfler, and Alex Lifeson of Rush, and they all rely on the unique tone of a Les Paul to get the job done. And now, you too can get the Royale treatment by owning a real Les Paul Standard at a price that won't break the bank! Visit your nearby Authorized Epiphone Dealer today and discover the heart of rock and roll with the Ltd. Ed. 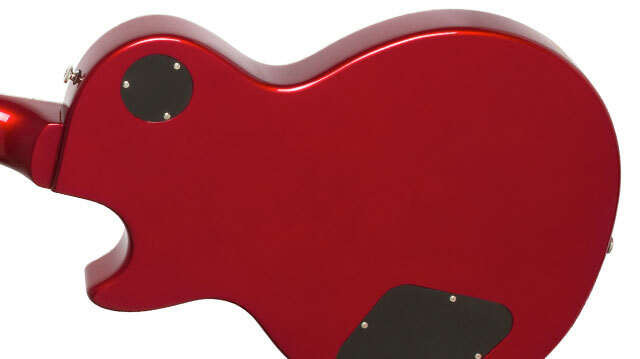 2014 Les Paul Standard Red Royale. The Epiphone Ltd. Ed. Les Paul Standard Red Royale features a solid Mahogany body and Maple top that deliver the classic tone and sustain that can only come from a real Les Paul. Like all Epiphone Les Pauls (and unlike imitations), the Ltd. Ed. Les Paul Standard Red Royale features a 14 degree headstock that gives you more pressure at the nut for more sustain with less tuning hang-ups caused by "string-tree" gadgets. The Mahogany neck has the legendary SlimTaperTM D profile and is hand-set and glued for outstanding string-to-body resonance. The fingerboard has a 12” radius, the standard Les Paul 24.75” scale, a 1.68 nut, medium jumbo frets for smooth fretting, and classic trapezoid inlays. The body and fretboard both feature the Royale Collection’s distinctive Silver Sparkle binding. The Ltd. Ed. 2014 Les Paul Standard Red Royale is powered by a pair of Alnico Classic™ humbucker pickups, each specifically voiced for the rhythm and lead positions, that deliver the warm, rich tone known the world over as the “Les Paul Sound.” Epiphone-designed humbuckers utilize a double vacuum waxing process that ensures quiet operation free from microphonic hum. After winding, the pickup is first placed in a specialized wax vacuuming system before the cover is placed on the unit to ensure that the wax fully penetrates to the very center of the pickup and solidifies all parts. After the cover is placed on, the pickup is given a second vacuum wax bath until the unit is completely saturated. Epiphone uses only the highest quality parts for our pickups including ABS plastic bobbins, 1010 Cold Rolled Steel pole shoes and pole screws, Alnico magnets (just like original hand wound and sought after vintage “PAF” pickups) and the finest magnet wire available. The Epiphone Les Paul Standard features our legendary rock solid hardware including a locking LockTone™ Tune-o-matic fully adjustable bridge and Stopbar tailpiece. And now, Epiphone’s updated patent pending design auto-locks the bridge and tailpiece in place with no tools needed for even better and super fast and easy string changes. The Epiphone Les Paul Standard uses 1" diameter potentiometers for better "throw," longer life, and reliable service. Epiphone’s all-metal toggle switches use rugged spring-steel contacts to ensure years of reliable service and performance. And Epi’s proprietary output jack features an improved contact shape and heavy-duty spring steel to increase reliability. All Epiphone Les Paul Standards come with Grover® machine heads for quick and easy tuning that’s responsive and reliable.